Can you guess how excited my kids were? We let him rest in the shade and gave him some water and carrots. He stayed for a couple of days and the kids loved having him around. I also added a sweet Lunchbox Love Card to remind them how sweet it was of them to care for the bunny. 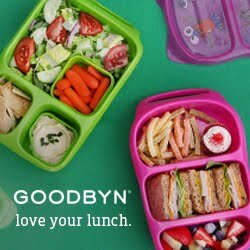 Seriously adorable lunches. But I'm a little sad that your little friend didn't adopt you.